Jeff Nichols grew up in Stockton, California where he took an interest in water polo, theatre, and speech & debate. 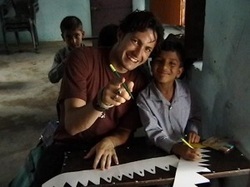 After earning his degree in Theatre from California State University, Northridge Jeff ventured across the world to Palampur, India where he worked as a volunteer teaching English and working at a local orphanage. When he returned to the states Jeff decided to continue his adventures in travel by moving to New York to resume his study of the craft. (Acting, that is.) Jeff studied at the Lynette Sheldon Actors Studio in New York before returning to Los Angeles to pursue a career in film & television. Jeff has performed in both theatre and film in "The Grapes of Wrath" "The Three Sisters" (for which he was nominated for the Irene Ryan Scholarship for Acting Excellence) and most recently in his self produced film "To You. To Us." (which won an Award of Merit from the Accolade Awards). He currently resides in Los Angeles, studying with Stephanie Nash and continuing to pursue his love of story telling. - After shooting a Co-Star on Discovery ID's Unusual Suspects, Jeffrey is now in rehearsals for Coeurage Theatre's West Coast Premiere of The Sparrow, opening October 24th at the Lankershim Arts Center. - Jeffrey just finished shooting on the short trilogy film, Break Aapart. - "To You. To Us." screened to great applause at the Sundial Film Festival! - "To You. To Us." can now been viewed on Vimeo! - The Lion, The Witch and The Wardrobe was a hit and may be going on a national tour. Check back for updates! - Once again Jeff will be hitting the stage in San Bernardino at the California Theatre of the Performing Arts in May 2012. He will be joining the cast of The Lion, The Witch and The Wardrobe. - Jeff recently signed with Film & Television agent Patty Vittoritto of Visionary Artists. - "To You. To Us." has finished shooting! Thank you to all who helped and we look forward to sharing this touching story with you on the festival circuit! - NEW PROJECT! Jeff will be starring in a new short film “To You. To Us.” A drama about saying good-bye before you’re ready. The project is currently in pre-production, more news coming soon. - 10/20/10 Jeff will be joining Elite Theatricals in their production of Amadeus at the California Theatre of the Performing Arts! - 12/9/09 Jeff is now SAG eligible! - 11/14/2009 Shepard plays at the Mosaic LA film festival. - 10/20/2009 Mosaic LA film festival has chosen Shepard as one of it’s 12 finalists to screen at The Mayan in downtown Los Angeles on November 14th, 2009. 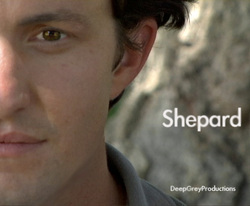 - 10/5/2009 “Shepard” DVD’s are now available for purchase online. Go to www.DeepGreyProductions.com to purchase a copy for only $10.